Some of you may have already seen the total solar eclipse photographs I posted on my social media. I’d like to share with you how I made the following image. First of all, this was my first time taking images of the solar eclipse, let alone the totality. So I did some research on how to photograph the total solar eclipse before heading to St Louis last weekend. The most important thing I learned was that the dynamic range of the corona is really wide, and I would have to take a series of images with different exposures to capture the “full” picture. 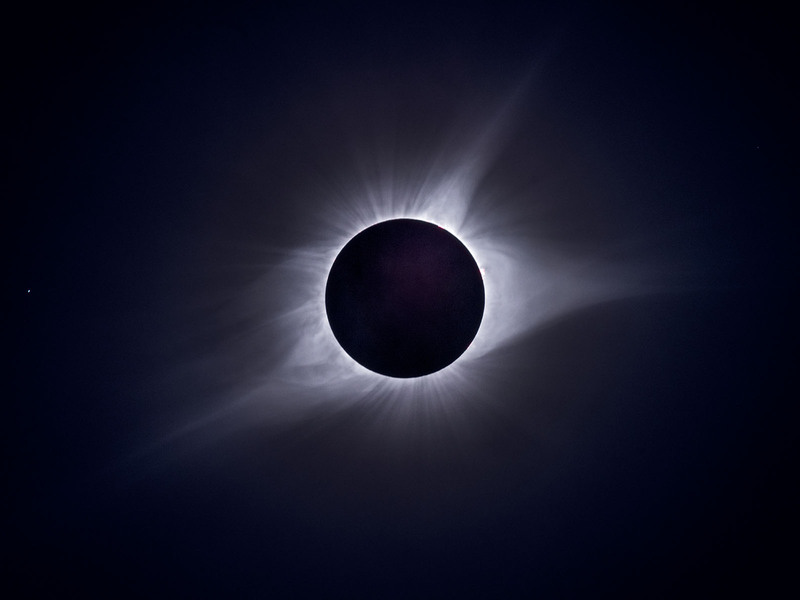 Although there are some guidance on the exposure settings, the actual exposure bracketing sequence still depends on the situation on the day of the solar eclipse. Hence, a little bit trial and error would be needed at the beginning of totality. The challenge was that the totality near St Louis would last only a little more than one minute. That’s not a lot of time! I didn’t have any telephoto lens, but I was too late to rent one. So I bought a used Canon EF 100-400mm f/4.5-5.6 II lens and borrowed a Canon 2x Extender III from my partner Max. This would give me a 800mm f/11 lens, which should be just fine although not ideal. I tested the setup with Canon 5DS and Fujifilm GFX-50S and decided to use the Fuji for one reason. The biggest enemy when shooting with a telephoto lens is vibration. So a remote release is necessary. I do have a cable release for Canon, but Fuji’s Remote App on my iPhone really comes in handy in this situation. I can change the camera settings without touching the camera, and I can review the image on my iPhone right after I take the picture. Of course, during the totality, I would still have to move the camera because the sun is a moving object — well, actually the Earth is the one that moves. Anyway, the less often I touch the camera, the better. As mentioned before, the totality would only last a little more than one minute. Minus the time for trial and error, I really wouldn’t have much time to shoot the sequence. Luckily, I found the right exposure within three frames, and from there I took a sequence of 7 images, one stop apart. Then the totality was over. It’s funny that, as I was so focused on my iPhone checking exposures, I totally forgot to look up to see the totality myself! But I knew I got the shot. High-Dynamic-Range (HDR) photography is no stranger to me. But it’s different this time. Since the images were not aligned to each other, Lightroom or Photoshop would not do the trick automatically. I had to manually blend them into one image. It took me some time to align the images although. The next total solar eclipse in the United States will be on April 8th, 2024. The duration of totality will be longer, like 4 minutes. If you are in the US and you’re interested in photographing the total solar eclipse, now you have 7 years to prepare for that!